The “twin cities” serve as a regional center for the upper Midwest and northern Great Plains. The fully cosmopolitan area is a balanced industrial, commercial, educational, and cultural center, and functions much as one city. The area is one of the most economically diverse in the country, serving as headquarters to large firms in agriculture, food, banking, technology, retailing, healthcare, and transportation. A few of the well-known companies include General Mills, 3M, US Bancorp, United Healthcare, and retailers Target and Best Buy. Job growth is still fairly modest, but overall, the Twin Cities have have a strong and prosperous feel. The twin downtown areas sit on either side of the Mississippi River. Both are modern with attractive buildings, clean streets, entertainment, nightlife, parks, museums, and other first-class cultural amenities. Minneapolis is more progressive, energetic and cosmopolitan while St. Paul is the smaller, quieter and more traditional of the two. Both downtowns are well used and aided by a network of elevated interior walkways called “skyways” connect buildings and attractions—a feature necessitated by the harsh, winter climate. According to one source, the area has more theaters, dance companies, and classical concerts per capita than any city outside of New York. Because Minneapolis-St. Paul is not a tourist destination, the local population enjoys these amenities almost exclusively. The population is highly educated, schools have an excellent reputation, and there is an abundant intellectual energy among the area’s citizens. For those not interested in the arts and downtown scene, there is still plenty to do. Sports are a big attraction—the city has a full assortment of major- and minor-league sports teams. On the south side of Minneapolis in Bloomington, the Mall of America—with 400 stores—is the largest mall in the U.S. and is as much an amusement park as a mall. Such indoor facilities are particularly attractive given the winter climate. Summer recreation includes outdoor activities on the many surrounding lakes and wildlife viewing. Winter-sports enthusiasts enjoy ice skating and hockey, snowmobiling, and cross-country and downhill skiing at nearby facilities. For those wishing to get away, air service is excellent, although the dominance of Northwest Airlines can mean higher fares. The downtown area is surrounded by a patchwork of residential and commercial neighborhoods which are on the whole more attractive than most other cities of the size. Some of the better suburbs lie south and west of Minneapolis. The more upscale Edina and Eden Prairie are comfortable and well planned. Bloomington and Richfield are more middle class with substantial commercial and retail development. Large super-suburbs, including Lakeville and Apple Valley across the Minnesota River to the south, offer excellent family settings. Farther west, Minnetonka, the small upscale lakefront Wayzata, and the booming Maple Grove to the northwest offer an excellent set of residential choices, with considerable employment nearby. Commutes are busy and getting busier, but the variety of neighborhoods and location of commercial and industrial areas makes it possible for residents to choose their commute. Not to leave St. Paul out, Woodbury, Maplewood, and White Bear Lake are excellent suburbs; each with its own collection of quality employment in commercial areas nearby. Cost of living has traditionally been high by national, and particularly regional, standards, but the rest of the nation is catching up. That said, the more expensive areas are far more expensive especially on a Midwest scale, and Minnesota taxes are relatively high compared to other states. For those willing to wear warm clothes and sacrifice a little financially, the Twin Cities have a lot to offer. Terrain around the Twin Cities is flat or gently rolling, with a mix of open and densely wooded areas. Dotting the surrounding landscape are numerous lakes, the largest being Lake Minnetonka, 15 miles west. Most lakes are relatively small and shallow and freeze in winter. The climate is northern continental with seasonal temperatures varying from –30 degrees or lower to over 100 degrees. The area is near the northern edge of the influx of Gulf of Mexico moisture. Summers can be warm and humid, but are usually pleasant. Winters are cold, with days ranging from cloudy near freezing to clear, bitter cold, and windy. The area averages 34 nights per year below zero, far more than any other large American city. Severe storms, including blizzards, freezing rain, tornadoes, wind, and hailstorms occur. Most precipitation occurs during the summer period, and snow cover is persistent through the winter, averaging 6 to 8 inches in the city and 8 to 10 inches in the suburbs. First freeze is October 1, last is early May. The median home price in Minneapolis is $248,900. Browse Homes in this Range. 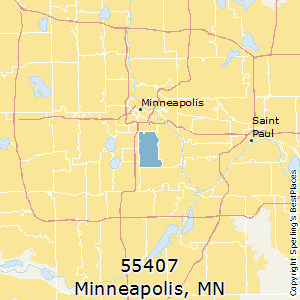 Compare Minneapolis (zip 55407), Minnesota to any other place in the USA.